A private Ketchum landowner has agreed to exchange more than 500 acres of land in southern Blaine County for 20 acres of BLM land north of Ketchum on which he has inadvertently been trespassing. The BLM announced Friday that it has approved the exchange with the Blue Canyon Corp. Ali Fayed, a prominent Egyptian business owner and U.K. citizen who owns property on the east side of state Highway 75 near the Sun Peak Day Use Area one mile north of Ketchum, is the corporation’s sole shareholder and president. The agency will grant Fayed 20 acres between his home and the highway. The environmental assessment associated with the exchange states that the parcel already contains storage sheds, a sprinkler house, air conditioning units, a split-rail fence, a basketball hoop, utilities and extensive landscaping, including a buried irrigation system. In exchange for the 20 acres, Fayed will give the agency 547 acres of land that he has been under option to buy from the Wood River Land Trust, pending approval of the exchange. The land contains two parcels currently under private ownership but surrounded by BLM land. The first, known as the Square Lake Parcel, is 240 acres of sagebrush, wetland and wildlife habitat on the west side of Highway 75 about five miles south of U.S. Highway 20. The Idaho Department of Fish and Game has identified the area as pygmy rabbit habitat, and the BLM has designated the area as habitat for sage grouse, songbirds, short-eared owls and blackbirds. 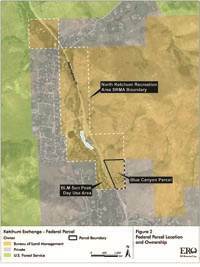 The parcel contains 29 acres of wetlands and a large sage-grouse lek at its southern end. The second parcel is known as the Sheep Bridge Parcel, located along the southern side of Highway 20 at the confluence of Rock Creek and the Big Wood River. The 307-acre parcel is directly north of Magic Reservoir, and mostly sagebrush steppe habitat. It contains 27 acres of wetland habitat and is within priority habitat for sage grouse. The parcel also contains mule deer, elk and pronghorn migration routes. Wood River Land Trust Executive Director Scott Boettger said his organization was able to buy the two parcels only because of its work with Blue Canyon Corp. Boettger said the corporation approached the Land Trust more than six years ago in an attempt to find land that the BLM would be willing to take in exchange for its 20 acres north of Ketchum. Boettger said his organization took a long time to identify properties that would not only be appealing to the BLM but would also be prime parcels for conservation and long-term management by that agency. Boettger said the Land Trust saw the purchases as an investment, a way to buy and protect critical wildlife habitat while also being able to eventually recoup some of the cost of the land once Fayed had agreed to buy it. Wood River Land Trust spokeswoman Keri York said it had bought the land at what was a “bargain price,” as the previous landowners donated a portion of it. However, she said, the Land Trust will not recoup all its expenses due to the fact that property values have fallen significantly since the purchase was made. The exchange first went up for public comment in late 2010. However, the agency stated in a Friday press release that it would “welcome” more comments. Comments should be submitted in writing to Holly Hampton, assistant Shoshone field manager/monument manager, 400 West F St., Shoshone, ID 83352, before Nov. 26.